Party Ideas by Mardi Gras Outlet: Mesh Crawfish Sacks make fun Crawfish Boil Centerpieces! Mesh Crawfish Sacks make fun Crawfish Boil Centerpieces! Traditionally, live crawfish come in bright red mesh sacks. These mesh sacks allow the crawfish to breath and keeps them from pinching us. Crawfish sacks can also be used for some creative inexpensive decorations for a crawfish boil. Crawfish boils are usually messy and there are lots of tables involved. Who wants to put out a nice vase and fancy centerpiece only to have to hose it off later to get it clean? Now we have a great alternative! These festive bright red crawfish sacks come in a variety of sizes and are very inexpensive. I have come up with a few different options for using them to decorate. Check out the ideas below! Because newspaper is often used in place of table covers at crawfish boils, this variation uses plain old newspaper to stuff the sacks. Add swirls of newspaper at the top and you have an instant centerpiece that you could afford to do on every table for a crawfish boil of any size. Stuff the crawfish sacks with colorful produce from the supermarket. We used the same things that are normally boiled with crawfish. Lemons, corn, potatoes and garlic add color and life to the table. They are not only reusable, but also inexpensive to buy. I really love the way the corn looks. Opening the ends of the ears of corn makes them look like a bouquet of blooming flowers. Best of all, after the crawfish boil is over you can use the left over crawfish tails and the all this produce from your centerpiece to make a big pot of crawfish and corn soup. Yummy! A nice option for topping your crawfish boil tables is this fun Kraft Louisiana/Crawfish paper that comes in rolls that are 24" wide by 50 feet long. Roll this paper down the center of the tables as a table runner. The kraft colored paper coordinates well with the red crawfish sacks. This time these red crawfish sacks are stuffed with coordinating Louisiana/Crawfish tissue paper. 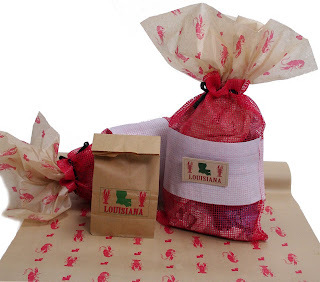 Louisiana Gift tags and small kraft colored lunch sacks add to the Louisiana/Crawfish theme. All these products work together to create another fun, festive centerpiece that is not only easy to put together, but also inexpensive. Visit MardiGrasOutlet.com to buy these versatile crawfish sacks and the other Crawfish Boil products for your next boil!